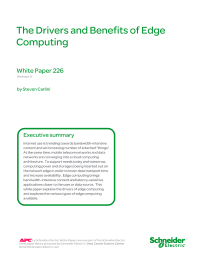 Download this white paper to explore the drivers of edge computing and the various types of edge computing available. Types of edge computing include local devices, localized data centers, and regional data centers. The one that provides the deployment speed and capacity in-line with future IoT application demands are the localized 1-10 rack versions. These can be designed and deployed quickly and easily with either configured-to-order or prefabricated variants.